Maddie’s Socks – Gone in 60 Seconds! Maddie and her parents have been going toe to toe (that’s right) for several months now in the never ending battle to keep socks on the baby’s feet. Maddie is barely 5-months-old, yet we have been struggling to keep socks on her for about four of those months. My little girl has perfected her sock disposal techniques into a true art form. Just as Brad Pitt became the master fly fisherman in Robert Redford‘s classic, “A River Runs Through It,” Maddie has mastered the art of sock-punching! There I said it – my daughter is a sock-puncher. 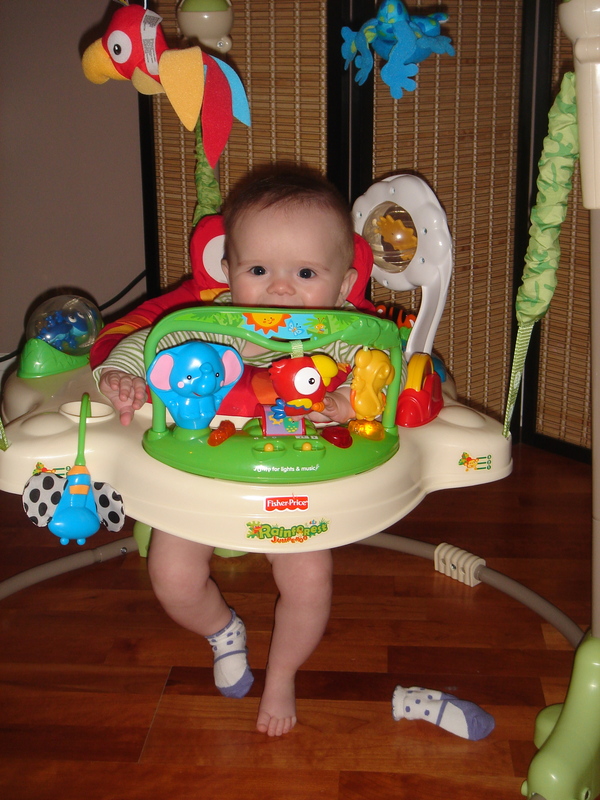 If the baby is awake – no pair of socks is safe on those wild feet for any length of time. Back when she was an amateur, she would shake and kick until they would eventually fall off. Those days are long gone. Now, Maddie uses one foot to aid and abet the other in an effort to shrug off the offending sock within 60 seconds. When we visited Maddie’s grandparents during the holidays, we were constantly on the lookout for discarded socks around the house. Sure we tried to outsmart the baby – we went out and purchased longer socks to thwart the baby’s best attempts to knock the socks off. It turns out that the longer socks are easier to knock off than the short ones. I suppose we could just let the baby hang out with no socks on, but her feet get cold, so that is obviously not a viable option. I like to tuck them into the baby’s pants, but my wife has repeatedly cautioned me about such a fashion faux pas. Suffice it say that we have given ourselves up to fate. We will continue the exhaustive sock “search and rescue” efforts until some company develops a baby sock with just a kiss of elastic in them. Until then, Maddie will delight in her parent’s fruitless attempts to keep those perpetual feet under cover. This entry was posted in Clothing, Hands & Feet, Socks and tagged A Pair of Socks (Mathstart), baby, Brad Pitt, clothing, Maddie, Robert Redford, shopping, Sock, socks. You are truly one funny man! I just stumbled upon your blog and you’ve had my husband and I in stitches. Great job! We completely relate to your tales with a 5 month old of our own. Anyway to assist with your sock issues, have you heard of a product called sockons? Someone gave us these when our son was born and they have proved quite useful. Thanks for the sock tips. We just ordered two pairs of sock ons and will report back after Maddie has had a chance to sample them! I also look forward to following your adventures as well!